Ok so I need some advice. I’m between two choices I’ve got some money put back for a new table saw. It will be a huge leap for me (kobalt contractors saw right now). I’m looking at the sawstop contractors saw with t glide fence, cast iron wings, dust port, and mobile base. (All of my budget). Or I can get a grizzly g0715p and also get a 8inch jointer g0656w or the g0490 for the same price. I don’t have a jointer right now and I know that would greatly improve my shop, but the sawstop is my dream saw. I’m a barber, guitar player, painter and woodworker, so my hands are everything to me. -- Cut hair, cut wood, go to sleep, repeat. I think you answer you own question. It’s all about the digits. $ digits vs. finger digits. Save the digits. You can also have a mishap with a jointer. Go with your Dream saw. Griz g0715p and Incra is a stellar combo. You have to chose between quality and quantity even putting the safety feature aside. Besides a jointer is not strictly a must have tool. You can substitute it with other tools in most cases. Hey wwbarber! The sawstop is in my honest opinion your best choice, I own one and it was one of the best buys for my shop ever. You can’t put a price on safety, always go with more protection even if it costs a bit more. Have fun! A couple months back I was trying to decide between a Sawstop and Grizzly and was thinking the same thing…... I could buy other tools with the money I would save by purchasing the Grizzly. I search some table saw accidents on google and youtube. I’m now the owner of a brand new Sawstop PCS. The other tools can wait until I can afford them. Can’t replace fingers. IMO, don’t bottom feed. What I meant by that is, don’t buy the bottom “price-point” product from either/any manufacturer. Jump up one or two models, and you will find a better success rate in getting quality equipment. I didn’t look very hard at the safety features when I bought my PCS, just at the saw. FWIW, I’m getting jointer quality edges with my PCS and the 40 tooth blade the saw came with. When I buy a better blade, I’m thinking even that already good finish will improve. I like what I see- Much more saw and a 8”jointer vs a contractor saw. With power tools safety must always be of concern- please post your decision. I learned a long time ago that buyer’s regret is a bitter pill. Since you say the Sawstop is your “dream saw” you may regret a decision that does not include the purchase of your “dream saw”. Additionally I have come to believe that quality tools come at a higher price but tend to be a pleasure to use over a long time. I do not own a Sawstop, but from the many posts I have read, Sawstop seems to offer quality (high value) tools. I believe you are correct; adding a jointer to the shop will improve the ease and quality of your woodworking. If you go with the Sawstop option, you could also buy a used Craftsman or other brand jointer probably for around $100 maybe $200, until your budget allows for a jointer upgrade. 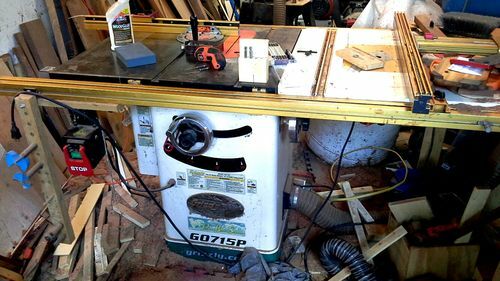 The benefit of buying an inexpensive used jointer is that for a little money you can gain some experience with the jointer. This experience could be invaluable when the time comes to upgrade. Once upgraded, you could conceivably sell the used jointer for nearly the same money it cost to buy. I think you should buy the saw of your dreams but I own the saw that HorizontalMike says is a “bottom feeder”. It is a very fine tool for what I do. I try not to pass out advice on something I have never owned and don’t have any experience with. This is coming from a person who has been woodworking for 40 years and has owned several table saws. I also am lucky enough to be able to buy whatever brand and model I want. I got that way in part by being frugal and buying what I need rather than what someone else thinks is worthy. Here is my comment on JBrow’s thoughts. When I started woodworking, I built and sold internal bee hive parts. I bought a used 4 inch “AMT” brand jointer powered by a 3/4 hp washing machine motor. A few of the old timers may still remember the brand. I doubt if I paid $50 for it. I eventually gave it away but not before I made several thousand dollars using it. It worked great for those small parts. Today I own a 12 inch jointer because that is what I need for what I am doing. Good used 6 inch jointers are abundant and inexpensive, at least where I live. I think you should buy the saw of your dreams but I own the saw that HorizontalMike says is a “bottom feeder”. It is a very fine tool for what I do. I try not to pass out advice on something I have never owned and don t have any experience with. This is coming from a person who has been woodworking for 40 years and has owned several table saws. I also am lucky enough to be able to buy whatever brand and model I want. I got that way in part by being frugal and buying what I need rather than what someone else thinks is worthy. Nicely put. I expected a pro Saw Stop response from this site and yes it is a fantastic saw. That being said, think of the “logic” behind the pro Saw Stop ( SS) reasons for it. Yes it is designed for safety; but other than a workshop with more than a table saw- how many more machines are there in the shop that can disable you? Therefore, if the concern for your hand safety is your priority then SS otherwise buy what YOU want or think that you want. Here is my comment on JBrow s thoughts. When I started woodworking, I built and sold internal bee hive parts. I bought a used 4 inch “AMT” brand jointer powered by a 3/4 hp washing machine motor. A few of the old timers may still remember the brand. I doubt if I paid $50 for it. I eventually gave it away but not before I made several thousand dollars using it. It worked great for those small parts. Today I own a 12 inch jointer because that is what I need for what I am doing. Good used 6 inch jointers are abundant and inexpensive, at least where I live. I follow you so far but -Do these used 6” jointers have the “helical head” and the trend is helical head 8 -12” wide- but no Saw Stop safety mechanism. Go with Grizzly or Laguna new. Just my opinion.